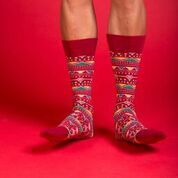 Sock Fancy, the direct-to-consumer sock subscription company, is releasing a limited-edition holiday sock design in addition to brand new shipping options, allowing customers to schedule arrival dates for an extremely tailored gifting experience. 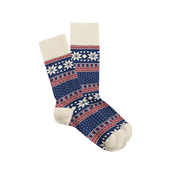 Subscribers can expect custom packaging as well as an additional pair of the limited-edition holiday sock design featuring a modern Nordic pattern, when they apply the promotional code. New this year, purchasers will be able to select a custom ship date, ensuring delivery within any window, personalizing every gifting need for celebrations throughout the holidays. “We are excited to kick-off gifting season with our ‘Your holiday in the bag’ campaign. We want our customers to know that we’ve got you covered, no matter who you buy for. A Sock Fancy subscription is easy, hassle free and sure to score you major gifting points with minimal effort,” said Stefan Lewinger, co-founder and CEO at Sock Fancy. Advanced shipping options will roll out November 1 and the holiday sock promotion will begin Friday, November 23 and run through the end of December or while supplies last. Founded in 2013, Sock Fancy is a digitally-native vertical sock company. Specializing in a monthly sock subscription service, Sock Fancy delivers unique, on-trend socks directly to your doorstep. Subscriptions range from one pair to six pairs per month, all designed in-house at their headquarters in Atlanta. Each subscription is customizable to size, quantity, and frequency paired with a no questions asked cancellation policy. Sock Fancy has been featured in well-known media outlets such as Inc. Magazine, The New York Times, and Forbes Magazine.